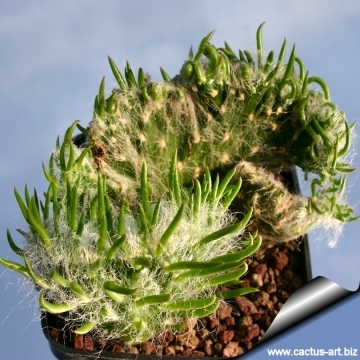 It forms slim fans with dramatic fasciated tips densely cloaked with thin long white hairs. 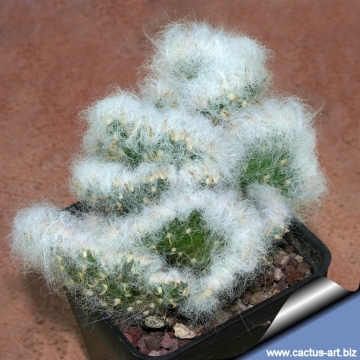 Description: It is usually a slender columnar white and very furry cactus from high altitude. The standard plants form branch both basally and near the top of the stems. Flowers: Austrocylindropuntia vestita is not a reliable bloomer. When flowering finally occurs, the flowers will be a beautiful deep red or violet up to 2-2,5cm . The hairiness of the pericarpel is mostly as dense as that of the stems, merely the spination remains less. The flowers are developed always at the top of the stems. 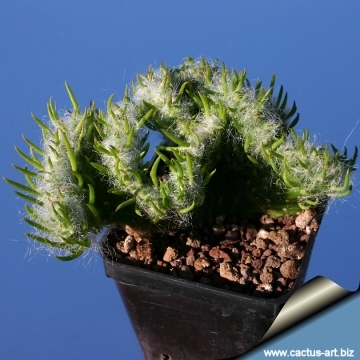 Crested form: The nice crested form has unsegmented, undulating pads covered with fine white hair and is now common and present in most gardens. 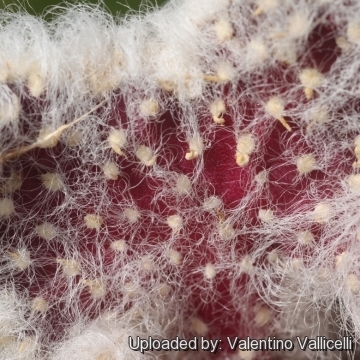 Flowers eventually appear on any reverted "Cotton Pole" slim stalks. 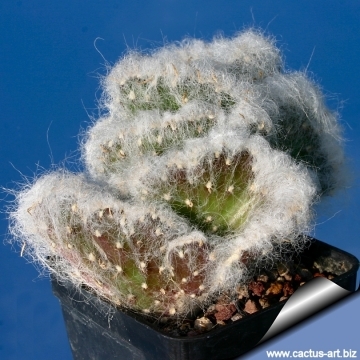 Cristate forms generally occur when injury occurs to the plant at a young age (this damage can be due to insects eating the growing tip, or from many other causes, including a genetic predisposition). In reaction to the "injury", the cells at the tip of the branch where growth occurs begin to multiply at a much faster rate and the normal growing tip "goes crazy", creating fantastic whorls and fans. 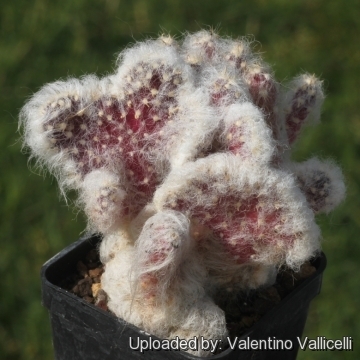 Notes: The genus Austrocylindropuntia comprises eleven species and was created by Curt Backeberg in 1938 for the cylindrical Opuntias of South-America. 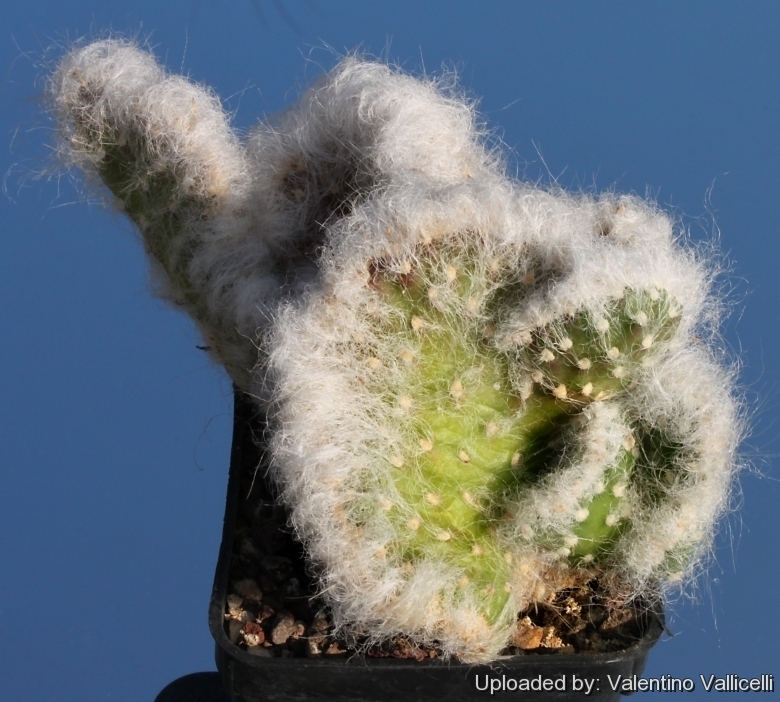 The cylindrical Opuntias of North-America was instead placed in the genus Cylindropuntia. Austrocylindropuntia can easily be distinguished from Cylindropuntia: Cylindropuntia spines have papery sheaths, Austrocylindropuntia spines lack them. 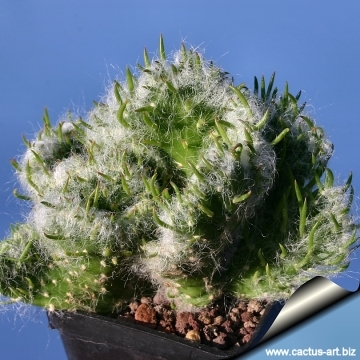 Austrocylindropuntia have cylindrical stems that grow indeterminately, not like many other Opuntias with stems that grow in a single season. Fresh stems have noticeable leaves that soon fall off. Austrocylindropuntias form low cushions o bushes up to 3 of 5m. The seeds are different too.